I lost the picture, but at one point, just by coming out of a PKMN Center, all graphics were screwed, and yet I could continue as normal. This occured on REAL HARDWARE, which, luckily, was a DDS (Debug DS) I got off eBay, which included video-out. This isn't a "glitch occurance" per se but must have been hilarious to see. After spending a day getting some glitch pokémon for an e4 swiping and having had to deal with cooltrainer move shenanigans (including the mildly amusing variation I found leveling up m lm4 "# # $ q ## ... [on other page] Bunny! ") 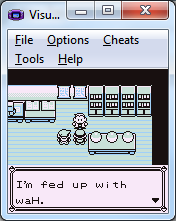 I saved my game and head for victory road (which i had't yet beaten). Find a trainer, face it. Message on discord. So I minimize the emulator, talk to the person a bit and come back. 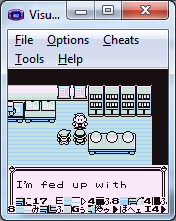 Emulator decides to lag and produce broken noise. Forgetting what I was doing, I jump as soon as I see "CoolTrainer(female)" pop up on the screen and proceed to s**t myself internally. 0.0001 seconds later, I realize. It's a goshdang trainer battle, that's her class. Cue laughing at my own disproportionate reaction. This isn't a "glitch occurance" per se but must have been hilarious to see. Anyway, same hack, when i wanted to save, it yelled WEEVEE at me, then BLUEREON. I will upload the screenshots later.